I’m a great believer in continued learning — it’s good for us in so many ways. Whether you’re upping your parenting skills, training in a sport, perfecting your camera eye, sharpening your business acumen, or any of a million possibilities, learning just makes you . . . and your world . . . bigger, brighter, easier, and often more rewarding. One thing I love about the Northwest pet community: if you want to learn, or just connect with others of like mind (which to me is somehow very similar), the options are abundant. And awesome! Vonnie and I were at a workshop recently, an outstanding presentation by Marilee Muzatko at DoveLewis on End of Life Care for pets. Admittedly it’s a tough subject, but one that given a little time, attention and learning can go so much smoother for person and animal alike. And on that particular journey, smoother is incredibly valuable. Vonnie also recently attended and was super impressed with a first aid workshop presented by VCA Northwest Veterinary Specialists. This one was months ago, and Vonnie is still raving about the quality of the information and resources presented. Many other organizations offer great programming as well. The two I mentioned are free, but not all are. Worth noting is that free does not mean a lesser quality experience, proven paws-down by the programs offered by these two agencies. There’s little in life that we can’t enjoy more, or have a higher quality experience with, after gaining more knowledge. Working, playing, and everyday life matters such as diet and exercise, can all be upped a notch when we receive the benefit of others’ knowledge and expertise. I encourage you to take a look at some of the local offerings — a few names worth checking in addition to VCA NWVS and Dove include Wonder Puppy for training, and Stay Pet and Sniff Dog Hotels for training and playgroups. There are countless options — for programming and for organizations presenting workshops, classes and gatherings. Speaking of “gatherings” brings us back to Vonnie. Many of you have met Spot’s Vonnie at events, or maybe you’ve enjoyed her writing (she blogs on chickens and the ‘Couve and is also a feature writer). Anyway — Vonnie has been musing for months about starting a support group for those facing the changes and challenges that come in the later years of a best friend’s life. “Golden Ears” is what she calls it, a group she envisions as a relaxed network of pet lovers who can share tips, ideas, concerns and friendship — by phone, email, social network, at meetups for senior dogs, and maybe even converging at favorite watering holes. I wanted to share Golden Ears with you here as Vonnie would love to get a feel for your interest in the idea. And of course Spot would too! Vonnie and Spot go hand in hand in some ways, and this is one in which Spot is more than happy to serve and facilitate in any way we can. If you’d like to see a group like this form, or have thoughts and ideas, please send them to Vonnie@SpotMagazine.net, or post them on SpotMagazine.net or Spot’s Facebook page. Otherwise, I hope you’ll take a look at the many offerings of classes, workshops and other great happenings in this edition. Get growing! You’ll be so glad you did. August 1, 2012 by Jennifer McCammon - Spot Magazine. My neighbor Bob and I raced to collect the recycling bins today. Our little game of ‘First One There Puts Them Away’ randomly started long ago. Bob is more of a morning person than I am, so he often beats me to it. Wanting to do my part, I try to be ‘First One There’ as often as I can. Anyway! Today’s silly little footrace got me thinking . . . . I am blessed with great human beings next door on both sides, and we’ve had many years of being neighbor-family. Naturally, just like parents of human kids, we’ve shared many life moments involving our animals. We celebrated the day Bob and Kathy brought butterball Rudy the Golden home, a living teddybear. Many years later my hands would join the others lifting Rudy in for his last ride, on his way to rest after a catastrophic stroke. One of the magical times was the arrival of Diane’s Sophie. A beautiful calico rescue who now rules not only Diane’s home but much of the neighborhood, Sophie is our cover girl for the “kitty issue” next month. Sophie’s arrival was especially important, as she brought life and joy to Diane’s home after she’d lost her husband. Years before Sophie arrived, Diane and her wonderful husband John had a beloved yellow Lab named Sugar. Once when they were overseas, Sugar stayed home, where she fared better than in a home not her own. Checking on Sugar once while they were away I found her lying in the dim, too-quiet living room, head up but stock still, her sad gaze locked on the front windows. Since she’d already had a little stroke I was concerned about Sugar’s health in John and Diane’s absence. So I gradually coaxed her to spend time with my pack, in a process that took numerous trips over a couple of days. Day one she followed me to her back gate. Day two, to mine. Then she came to my back slider, and finally, in for lunch and many more visits to come. Sugar was a regular at our house ever after, sometimes for lunch, other times just hanging out when she pleased. She was love on wheels, and ultimately blessed both families, her own and mine. My neighbor-families tend my girls when needed and jump in to check those little things, like a coffeepot maybe left on. In recent years they’ve graciously endured the barking meltdowns that happen since Lula our ‘wretched red-headed rescue’ arrived. Together we’ve celebrated each others’ new arrivals . . . and helped with loving hands and hearts during the inevitable sad goodbyes. These are just a few examples of how our animals enrich our human communities. It plays out in a thousand ways every day in many homes and neighborhoods, at parks, pet events, and so much more. Racing Bob to the bins this morning reminded me how very much I have to be thankful for . . . for these precious neighbor-families, and for just how much richer our community is, thanks to our animals. July 1, 2012 by Jennifer McCammon - Spot Magazine. Celebrating the long return of sunny days, Peach and Lu recently got sporty little halters and we hit the pavement (it’s true: we’re fair-weather beboppers). Under friendly skies we generally clock 2 or so miles in our favorite stomping grounds: our own eighborhood. The terrain is a perfect mix of atlands and steep hills, so I get a little bit of a workout, and the friends, neighbors and landscapes in the ‘hood feed our souls. One thing that captivates me as we cruise is the unique gait sported by each of my girls. Lula, aka my ‘wretched redheaded rescue,’ is a sleek, leggy, dark red beauty who has a bossy little bounce and jaunty “back porch swing.” Peach, meanwhile, built like a 10-lb. dairy cow (stocky and a little butch), has this smoooooth stride that keeps her body sailing along just above the pavement — she is all about the glide. Despite the dramatic difference, every time we approach a rise or curb, they are suddenly, amazingly, in perfect sync, clearing each rise like dancers in flight. The sight takes my breath away; it’s a mystery how they seamlessly break stride for that split second when their bodies fuse as one, soaring beautifully. challenges our blind babies face and the tricks we use to protect the quality and manageability of their lives. My 6-lb. Scout is blind now, too, and further has “shaken baby”-type brain damage from a puppy-hood fall. Some days my tough little one does great; other days her NAV system is just off , sending her through the house like a pinball – bouncing off this cupboard, that chairleg, even the landing that’s been ‘right there’ all her life (she’s nearing 13). So now Scout guards the castle while we three head for the hills. Lula lunging at anything on wheels — cars, bicycles, skate-boards, you name it — and Peach zooming along, all little torpedo. As for me, I dance along happily, savoring every bit of sunshine, joy and vitality we get to share. While I don’t consciously dwell on how eeting their lives are, the certainty lives in my bones . . . ever reminding me to revel in these great days of beauty . . . with my crazy lunging loon and amazing flying torpedo. June 1, 2012 by Spot Magazine. Yep: that would be Spot. Celebrating its (not 10th but close enough) 7th anniversary in August, Spot is finally moving beyond baby steps and striding along in ways that make a parent’s heart sing. You, dear reader, are the boss, and it’s been wonderful to hear your consistent declaration of love for the magazine and the Spot crew’s work in animal welfare and helping businesses grow. In fact, your unflagging affection and support is a huge reason we made it this far — that and the confidence of our partner businesses, whose support makes possible each monthly issue. Please support them! There’s been a whole lot of uphill in growing up Spot, thanks to a mean economy and a dramatically-changing industry. BUT! We’re here to tell you, it’s time to celebrate! Spot just got prettier thanks to a printing upgrade, and if you haven’t already explored the new website, please do! Great adventure awaits, including tons of resources in “everything pet,” countless photos, ways to connect, contests, videos, broadcasts and more. Now you can check pet events for the upcoming weekend by clicking the “Broadcasts” button — reports are updated every Thursday/Friday following the 6 o clock live broadcast on 98.1 fm radio. 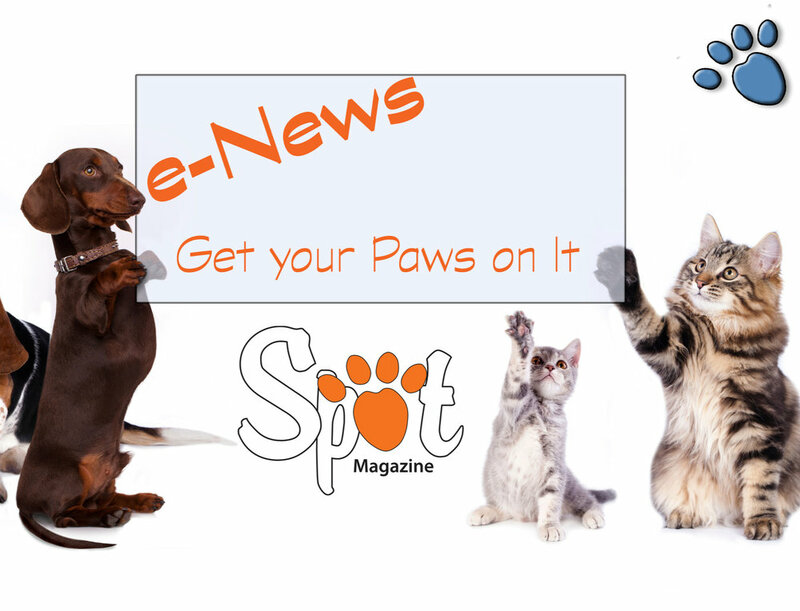 The website also has informative and entertaining blogs from numerous pet experts, the Spot crew, and members of the community who have amazing stories to share. Speaking of which, I hope you’ll take a peek at “Volunteering pays BIG” this month, a great tale shared by fellow reader, Denise Kinstetter. Denise is passionate about many things, and she’s on fire to encourage you in general, to make the most of life, and specifically, to experience the amazing gifts that come through volunteering. This award-winning volunteer divides her time between Multnomah County Animal Services and Oregon Humane Society, and we’re delighted to share her story with you. Do you have a story to share? Please do! This animal-loving community is filled with amazing people with extraordinary stories, and sharing them helps us all learn, laugh, and enjoy the ride — and each other — all the more. In closing, we hope to see you at Walk for the Animals May 5, the NW Pet Fair May 5 & 6, and/or Doggie Dash May 12. 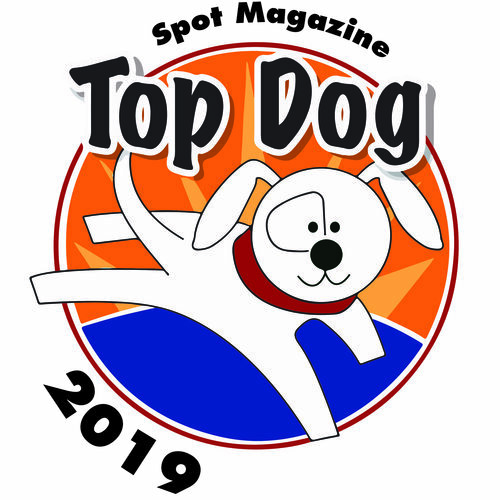 Spot is holding a “Pet Minit” video contest Sunday May 6 at the Pet Fair, so come out and show off your pet’s best trick, sweetest face, or the special story about your lives together. Videos will be shared and voted on, and the winner will get great prizes, including a gift certificate toward a Sunriver getaway at Bennington Properties, a soft harness from Four Paws Only, and a beautiful photo keychain from Jade’s Pet Frames. As usual we’ll have Goodie Bags (awesome new totes from CVRC and fantastic new contents from a variety of our excellent business partners), take-aways, and happy members of the Spot crew eager to see you again after the long hiatus in pet events. Come out and play! May 1, 2012 by Spot Magazine. If I could put Spot’s recent months in a bottle and dress it up with a sassy little vanity label, that label would read: “Rocketdogs and Wildcats.” What that means is — holy chewbone my friends! What a ride! Spot’s website (I’ve always called it “Spot’s House”), has been renovated, with a new design, functionality and depth of resources. The work’s been underway for some time, and we can’t wait to hear what you think! We hope you’ll check in often for the latest features, resources, happenings and contests, photos, broadcasts and more. In other matters . . . we’ve long had an eye on Seattle as a community that might also enjoy having Spot available locally. Indeed the need is there, so the first copies have been delivered. If you’d like coverage of something particular in that area please let us know. Meantime, we’ll continue to get acquainted with the rescues, retailers and pet-related and –friendly organizations and businesses that will be joining us in the growing community of Spot family friends and businesses. Oh, here’s a wildcat — Spot’s great friends at Bi-Mart occasionally contribute wonderful product for us to share, and a recent shipment has loaded the cupboards with great prizes. Check the website for current contests, and see the goodies up for grabs. A sweet side note: Bi-Mart’s recent bounty was generous as usual, allowing us to also contribute goods to two deserving shelters. Bi-Mart has long been a great supporter of animal welfare in the Northwest, and I hope you’ll join me in supporting this outstanding employee-owned business. And now a lil Rocketdog — you may have noticed the recent addition of videos complementing some of our stories in print. We’re having fun getting our video chops, but please be patient: our early work is a little low-brow and funky. Still, we hope you’ll find the videos fun, entertaining and educational. As always, we welcome and appreciate your suggestions. Here’s to a spring season filled with energy, smiles, adventures and new growth. All of us at Spot treasure the opportunity to serve you, we love the work, and we’d love to hear from you with ideas, suggestions and feedback. March 1, 2012 by Spot Magazine.